We recognize that violations of academic freedom anywhere are threats to academic freedom everywhere.
. . . there is, finally, no such thing as solitary confinement. The question of being inside and the question of how it is possible to speak this fragile pronoun, “we,” across temporal, spatial, and ontological difference, never cease to overlap and literally to inform one another. Being together is being inside. But inside what exactly? And across which bindings and boundaries? A copy of the university's proposal states that a tenured or probationary faculty member "may be terminated for adequate cause." The proposal further states that adequate cause for termination "shall include but not be limited to" nine reasons. The list includes reductions in force for economic reasons and a program's "substantial curtailment or discontinuance." Other reasons include "serious professional misconduct" and "failure to perform academic assignments competently." 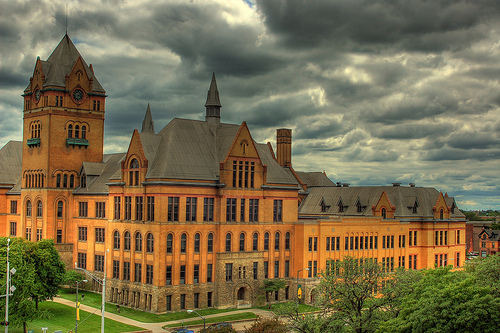 According to many commentators [and I have to agree], although Gilmour has said that it is "inaccurate" to think this means the end of tenure at Wayne State and has also stated that he understands tenure is important for issues of academic freedom, the provisions of the proposal [many of which are ambiguously worded], if accepted and passed, would make it possible for the administrators of the university to dismiss faculty without peer review for "adequate cause" and to also dismiss faculty and/or whole departments for reasons of "financially based reductions" [i.e., the university could claim that a department was not "profitable" and thereby let go all of its faculty and support staff -- this is just a conjecture, but the language of the administration's proposal points directly to this sort of possible outcome, which means they already have it on their mind as a "target," in my opinion]. Most important, I think, is that the administration's proposal seems to leave due process hanging in the balance, especially as concerns what sort of input faculty would have to review their own faculty colleagues, in which case, if accepted and passed, a peer-reviewed tenure process would, in a sense, cease to have any real meaning at the university and the university itself would no longer be a faculty-led institution, as it should be, nor would it serve what we might call a "public good" [granted, some of the corporate-minded administrators of universities may define "public good" differently than many faculty would, but profit interests should not drive what this definition might be, and it is faculty, at the very least, as well as students, who should be leading these conversations--more on which, below]. Connecting reasons to eliminate tenure with its supposed financial inefficiences and supposed propensity to shield under-performing faculty flies in the face of logic and REALITY for two simple and obvious reasons: (1) university faculty, especially in the humanities [where, let's face it, most current desires to "cut" are aimed] may be one of the few groups of *professionalized* and *technically expert* employees in the world who are tied to a pay structure that allows them only 2 opportunities in their entire career to be promoted and for very paltry increases in pay, I might add (typically, around 5% at most institutions); merit raises tied to annual evaluations are practically unheard of in academia and cost of living increases granted by state legislatures are typically way behind inflation [mine have been 3% or ZERO for the past 8 years, and I can share lots of stories of colleagues with zero raises of any kind for 8 years and more], and I can't even begin to address here all of the inequities that exist in pay structures between departments and programs [such that a professor who teaches marketing will always make much more than a professor who teaches Shakespeare and while there may be good reasons for this, isn't it IRONIC that when universities agitate to eliminate departments and programs and fields that they typically go after the ones that employ the lowest-paid faculty, who are also teaching the majority of the students through general education curricula and thereby also bringing in the largest share of tuition dollars? ], and THEREFORE the tenure system actually benefits the university, cost-wise, by helping to keep pay levels primarily flat and evenly distributed and *predictable* in advance, whereas with the corporate model we could all go in and demand to be paid according to our rates of productivity and high teaching evaluations and level of service, and boy oh boy would the money levels have to rise then, SPEAKING OF WHICH: (2) we work, primarily, in a virtue [and therefore, also, a service] profession -- id est, most faculty are decidedly NOT doing this for the money and what that also means is that you will be very hard pressed to find lots of under-performing faculty hiding behind the curtain of tenure; while not all faculty are powerhouses of production in all of the areas of research, teaching, and service, the majority are excelling in at least two of those areas [and again, for the most part, without merit pay, which means there is a very high level of admirable self-motivation at work in the university] and some are so proficient in at least one that it makes up for the differences of concentration between the three; in addition, given the increasing levels of oversight in the past ten or so years demanded by administrators, pedagogy specialists, assessment boards, state legislatures, and the like, our work levels have actually increased exponentially over the past ten years and for no monetary compensation whatsoever; the number of tenured faculty who who are wholly incompetent and of no service whatsoever is so small you couldn't find them with an electron microscope, which is why the idea that many supposedly "non-working" faculty members hide behind tenure at the local pub while everyone else is "working" is pure public MYTH [that doesn't mean there is no incompetence among faculty at all: is there ANY profession that can claim such? Good luck with that: you are dealing with humans, and not machines]. A university is not a business; it's more like a public trust or even something along the lines of an intellectual treasury, which should be intelligently and vigorously curated and safeguarded. But that does not mean, at the same time, that is should not adopt good business practices in its oversight, accounting, fiscal management, and the like. And that has actually been understood for a very long time [duh!]. It's true that sometimes faculty like to put their heads in the sand when it comes to talking about the fiscal management of the university [after all, we *are* dreamers of a sort, but very productive ones who also give most of our lives to the care of ideas *and* persons, our students especially], but the bottom line is that these two ideas are not at odds: (1) the university is not a for-profit business but rather a cultural institution that produces a very particular sort of "wealth" that improves lives, and (2) it should be managed with the highest possible fiscal management standards and "good business practices," so as to ensure its longevity and to keep its services and products ethically and practically "robust," and to also ensure that it can extend its educational programs to as many persons as possible with the least financial impact possible upon those students for whom a "higher" education should be a *right* and not a luxury. But faculty and administrators and the state and federal governments should be working harder together to determine what it means to fiscally manage well, not an educational business, but an educational-research institution, which [again] is a public trust. What this ultimately means, is that, yes, universities can be run *like* a business, but not a for-profit business [and the business world does have some smart things to teach us, believe me; I used to work in the corporate world for many years before starting my PhD studies and I do not see them as the enemy but as possible allies, BUT ONLY if they are willing to understand what a university actually is]. It's an important distinction. This is an exciting time to be working in the university when so many methodological and philosophical and technological and publishing [and I would also say, para-academic] shifts [of seismic proportions] are underfoot, but while many of us are excitedly caught up in the debates and discussions occasioned by these [for example, see the recent posts relative to the so-called "descriptive turn" in literary studies HERE and HERE, and also read this fascinating discussion on para-academia between the editors of Speculations and continent. journals], we must not lose sight of the larger economic conditions and administrative struggles that impinge, at every corner, upon our profession and that require our attention and vigilance [for example, in addition to the Wayne State University situation, are you paying attention to the fact that Apple, Google, Microsoft, Facebook, and Amazon are possibly determining everything that will happen in the global economy, of any serious import, now and in the coming years and that publishers like Macmillan, which determine so much of what gets published in the humanities, may actually fold? and when was the last time you thought about what was happening in Detroit, which is where Wayne State is located, and that is not an accidental context?]. Information overload is the name of the game these days and most of us find ourselves overworked beyond measure with increasingly less and less time to even attend to ourselves on a personal level [wine-soaked respite, anyone? ], but it's important that we take institutional concerns to heart as much as we do disciplinary ones -- we are, after all, public servants and this is the "trust" we hold with each other. To that end, please sign the petition to preserve tenure at Wayne State University HERE, distribute widely the open letter to Allan Gilmour from the California Scholars for Academic Freedom, a group that is founded on the idea that what happens anywhere to the university affects all of us [see below], and ruminate other measures you might take to make your voice(s) heard on this matter [for example, barrage Allan Gilmour with emails]. We, the California Scholars for Academic Freedom,* urge you, in the strongest possible terms, to withdraw your administration's proposal that tenured faculty may be disciplined and/or terminated by a single administrator without benefit of tried and true procedures for peer review and due process. Such a policy would be a disaster for academic freedom, and we therefore join the AAUP/AFT's opposition to it. Reportedly, you have stated that you support academic freedom, but the proposal’s terms are sufficiently ambiguous to allow you or any future president to politicize all evaluation procedures at Wayne State. How do you define “serious professional misconduct”? What “professional responsibilities” other than teaching and research might, in the breach, constitute “adequate cause for termination”? How would you determine “generally accepted academic standards and principles” without faculty input? What is “employment related misconduct” [sic]? What does “financially based reduction[s] in force” mean? To us it suggests that an administrator could arbitrarily decide to reduce the numbers of a department whose faculty were researching and discussing issues in ways disagreeable to him or her, without knowing anything about the field. Such an administrator could therefore use university (and taxpayer) money to do whatever s/he wants, with no accountability whatsoever. Your proposal further states that “adequate cause for termination of faculty and academic staff shall also include . . . forcibly interrupting the normal daily teaching, research or administrative operation of the University or directly inciting others to engage in such actions.” Besides attempting to stifle long-established traditions of peaceful civil protest on university campuses, such a policy would also threaten violation of First Amendment rights, since “directly inciting” is notoriously difficult to construe with precision. The consequences would include expensive civil litigation and the heightening of tension and distrust at your university. Since studies have demonstrated that the best ideas—the most innovative and the most viable —originate in atmospheres tolerant of critique, we also note how vital freedom of thought and expression is to the quality and reputation of any university, Wayne State included. The disadvantages of the proposal heavily outweigh any benefits that might accrue from it, since nothing less than the usefulness of Wayne State to its students, its business partners, and the citizens of Michigan, is at stake. You have reportedly said that even one bad employee is too many; but your wish to root out a few bad employees must not trump the higher goals of academic excellence and integrity, and constitutionally-protected freedoms. The advancement of knowledge is a good that transcends (but does not oppose) considerations of “efficiency” and "cost-cutting." Universities cannot be managed like corporations. Through trial and error, they have developed careful systems of evaluation to ensure that the best scholarship is encouraged and research fields continue to advance over time. What makes universities unique is the diversity and complexity of their goals and expertise. They bring together hundreds of very different, sophisticated, ever-evolving methodologies, working environments, and research topics, in the hope that interdisciplinary relations will (as studies of creativity suggest) spark previously unimaginable insights. No single administrator has the knowledge to evaluate any one of these diverse specializations or the work done by any individual within them, let alone to appreciate how cross-fertilizations and out-of-the-box thinking and behavior might be bringing along the world of tomorrow. What is required instead is the very combination of specialist expertise, interdisciplinary consultation and administrative input that constitutes university assessment procedures today. Academic freedom is either there, or it isn’t. Only if academic freedom and due process are protected absolutely will the parents, alumni, scholars, professionals, policy-makers and innovators so vital to the prosperity of our universities be able to trust in the integrity of your faculty’s teaching and research. History has taught us that autocracy does not encourage the openness to exploration that is the university’s raison d’être. To err is human; like the legislative process, peer review was designed precisely to prevent hasty, prejudicial or ill-informed decision-making. Scholars must be able to brave controversy; had we not, for example, given the concept of neuroplasticity a chance, we would not now be benefiting from the new perspectives on the aging brain that promise to extend our productivity and well-being beyond previous expectations. Academic freedom, and the peer review that protects it, are the guarantors of, not obstacles to, the quality and trustworthiness of the work performed at any university. If your administration's proposal is forced on the faculty, the outcome will be a rapid plunge in the prestige and quality of Wayne State. It will undo decades and decades of hard work by your predecessors. Please think again. What they are proposing is already allowed at some universities, including my own. I'm being denied tenure based on a criterion in our collective bargaining agreement that's vaguely worded as "long term needs" and "some essential role" for the university. Enrollment declines in courses from some departments are enough to eliminate tenure lines, regardless of recommendations from all the faculty committees that approve candidates on the basis of all criteria, including the usual teaching, service, and scholarship. What's happening to Wayne State should not be fully disassociated from what's happening in Detroit, even though I understand this type of blog entry can only be so long two dynamics bear covering. First, Detroit and many surrounding cities are either under emergency financial management (or a facsimilie) or are under threat of it. Just today in fact another Detroit suburb (Allen Park) was deemed an EFM candidate. Detroit's public schools have been under some sort of state control for ten of the last 13 years. Second, Wayne State administrators are making significant changes that have the effect of reducing the Detroit student footprint in Wayne State. They are increasing academic standards, and they are creating dorms designed to make the university less of a commuter campus. In my estimation, the neoliberal turn in the American context requires some type of racial sort. It's clear this sort is at work in the attempt to change Wayne State's student profile. @Exhaust_Fumes: I looked at your Twitter photo and the wording in your denial of tenure letter kind of took my breath away; I'm very sorry about your situation. It's crazy to measure tenure decisions on criteria based on student enrollments and the like, but I *do* realize that is what is happening at many institutions, here and in Europe. Last year, all of the faculty at King's College London had to, in a sense, "reapply" for their jobs based on their research accomplishments and how many students they supervised, etc. One thing I want to add here, too, is that it kind of saddens me when I realize what amazing gains could be made in higher education if *some* business leaders would actually lend their savvy financial acumen and money to helping universities achieve their public service missions: this is just as important as fighting AIDs and malaria and poverty and the nuclear arms race, etc. It seems to me that many administrators [some of whom are former and current faculty as well] and business/industry leaders, as well as state legislatures, don't seem to understand what a hard-working brain trust they already have on their "hands," so to speak, and which should be capitalized upon, not stymied and shut down. It is either laughable or tragic [I can't figure out which sometimes] to see business figures try to "fix" the American university after they have already sold all of our larger economic and employment interests to the lowest possible bidders overseas, esp. in countries that exploit their workers. Can you out-source a university? I hope not. Thank you, @Exhaust_Fumes, for sharing your experience. I think it is really, really important that tenure-stream faculty (TSF) recognize that even when tenure is not being outrageously attacked by the university administration, as at Wayne State, tenure and its “freedoms” are often being eroded by other means, within the overall marketization of universities. So, while the fight for tenure is super-important, what might be more important than “tenure itself” (which is already being compromised in myriad ways by the changes to the whole system of higher ed that give tenure meaning) -- what could be more important is the FIGHT for tenure, which stands the chance of revealing the mutual precarity that binds tenure-streamers to adjuncts, graduate students, and indebted students. But “realizing” our precarity cannot be simply cognitive – TSF need to organize and act upon our solidarity with these other groups. As a friend of mine has argued, the adjunct system functions as a way for the powers-that-be to erode solidarity among people who teach classes at universities: it’s a way for the administration to get cheap labor from adjuncts, but it also puts the administration in a much better position to do away with tenure entirely, since you can't count on those who don't have tenure to come defend it. And it’s my impression that over all, tenure-stream folks have done a pretty minimal job of supporting adjuncts and grad students fighting for better working conditions (good intentions but not a lot solidarity actions or organizing, or even really knowing one another in a university…). So there is a ton of work to be done, in building the social and affective and organizational bonds that would make academic-labor solidarity a reality. Thanks for this post, Eileen! Here are some good links, btw. Thanks Julie and Eileen! The whole system too often makes it easy for us to hope we can squeak through and then not worry about it anymore. I've learned that many universities have the same provisions for tenure denial that my contract allows--it's just that people don't realize they are there because "long term needs" or whatever haven't (yet) been cited as grounds for denial. But the market's so tough that few people have the luxury of looking too closely as these things. I know I probably wouldn't have worried even if I known in advance...I was happy to have what looked like a pretty good job. As for King's College, I know about that--pretty awful, for sure. That said, I'd be pretty happy if my university actually cared to even ask me about my research accomplishments and students supervised. As far as they're concerned, all that matters after my 6 years and publication record is department enrollment numbers, which I have had zero control over. It's beyond frustrating. Julie, would you believe that the tenured-to-adjunct ratio was cited in my case as a factor in whether I'd earned tenure? That is, an administrator put in writing that we had too many tenured faculty and not enough adjuncts. It's not even an embarrassment to them that they'd prefer unjust labor contracts to tenure stream. You're definitely right that we need to fight for better conditions for everybody. Our fates are not mutually exclusive. Last year, all of the faculty at King's College London had to, in a sense, "reapply" for their jobs based on their research accomplishments and how many students they supervised, etc. Only the Humanities faculties, in fact. I bet you're surprised. (It did, however, include the administrators, and in the end very few people were actually fired. So that's almost OK? "... there is, finally, no such thing as solitary confinement" can never ever be quoted seriously again. I mean I see the point but really, there is.